In college football, the most interesting game of the weekend was #10 Ohio State’s huge win over rival #4 Michigan. The selection committee which determines the final four teams to play for a chance at the College Football Championship will submit their second to last rankings on Tuesday. The top four teams before this weekend were #1 Alabama, #2 Clemson, #3 Notre Dame and #4 Michigan. Now that Ohio State embarrassed Michigan 62-39, it’s likely Michigan will drop out of the final four with #5 Georgia moving up and potentially opening a slot in a couple weeks (depending on next weekend’s games) for Ohio State. The College Football Playoff Committee will submit the semifinalists on Selection Day, December 2nd so next weekend’s matchups are crucial. If you sat through the Texas A&M vs LSU game on Saturday, you witnessed the highest scoring game in Football Bowl Subdivision (FBS) history. With 7 overtimes and a final score of 74-72, the #22 ranked Texas Aggies defeated #7 LSU Tigers. In the NFL, one of the highlights of the weekend was watching Los Angeles Chargers’ quarterback Philip Rivers set the NFL single-game record for 25 consecutive completions (and best single-game completion percentage) in league history. 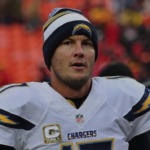 Rivers ended the day with 28 of 29 completed passes and three touchdowns. After the game Rivers said he thought he was doing well but had no idea he was making history. He said, “Those are kind of those far-off dreams you think about. Like, (what if I would ever play a game) where I don’t miss one (pass)? Then you quickly say (to yourself) — (it’s) probably not (going to happen)”. LA Chargers 45, Arizona Cardinals 10. For the rest of the NFL highlights, click here.